Typing speeds illustrates familiarity with computer. It simplifies your daily work, emails writing and increases your productivity. Save 30 min in writing 10 emails. Since this is a user friendly software, It trains you how to use the keyboard step by step. This is the best software for complex scripting languages like Arabic for non-localized computers in Europe. Plugins could be installed to training other languages with a small fees. There are 2 graphical games, one with falling letters and the second 2D letters roaming in space should be caught There are a lot of computer programs which teach you how to type using the keyboard. 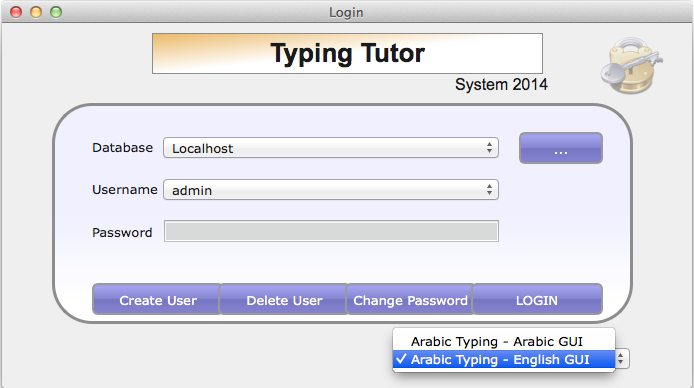 However, only a Arabic Keyboard Typing Tutor is for the Arabic Keyboard. This software is intended for people who need to learn how to type Arabic words. The program has a simple interface, and can be used by up to 6 users. Each of the users has separate statistics about his or her typing skills. A neat game is provided with the application, which helps you learn while having fun. Arabic letters appear on your screen, and you have to type them immediately after a surrounding green circle appears. You have access to 13 lessons, each one teaching you how to use another 2-4 keys of your Arabic keyboard. A hand appears on the right side of the user interface, showing you which finger to use when typing the next character. The sentences written are very meaning full either known sentences or pieces of poetry, as chosen by the publisher for the tests. However, from what I've seen, you have to use most of your keyboard keys to type them. A totally new interface and look .. Learning made easier The software was rewritten from scratch.